Hat wearing isn’t what it used to be. Prior to the 1950s, nobody would think about going outside without a hat, no matter the season. In fact, your hat, whether you were a nurse, a white collar executive or a gas station attendant told the world a lot about your socioeconomic status and what your occupation was. 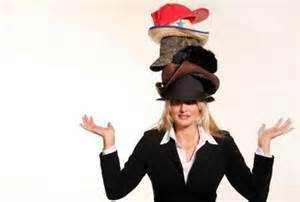 The phrase “wearing too many hats” emerged relatively recently. In the past century, the pace of our culture and the workplace evolved rapidly, women AND men are now homemakers AND marketing specialists, parents AND business owners. Of course, so much more too, we may coach a little league team and dance the two step on a Saturday night. While much of this is good and brings meaning to our lives, it also means that we must juggle. 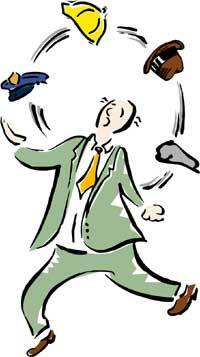 And anyone who has attempted to juggle knows that juggling for any length of time is hard to do! Even if you are good at it soon enough it is very tiring. And as you add more objects, it becomes more stressful. Then what can occasionally happen? It all falls down. There is where mindfulness can be enormously helpful. When we carve out time for just being, intentional non-doing, we reconnect with who we are at our core. No matter how we may be feeling in any given moment, we are not simply our roles or our obligations. While it is quite human to define ourselves in this way, it can often limit us, creating a growing sense of imbalance in our lives. Mindfulness widens the lens. We are not just divorced single parent, primary care giver, one who is always putting out “fires” at work and at home, or task master. When we sit in meditation practice, we put all of that down for a bit. I invite for the next five to ten minutes to try this: Breathe steadily and naturally, and with each out-breath put each of the “balls you are trying to keep in the air” down-one by one. Release the striving and to the best of your ability right now, the judging too. Within this space, something new may arise. Perhaps it’s the knowing that we are more than the sum of our parts. We glean that truth that any given role doesn’t truly define us. What is deepest and most valuable in us can be recalled and recaptured so that we discern what to do next from that perspective. May you approach the moments of your and those to come with a clarity of purpose and a sense of calm.